March « 2013 « Yeah, right! There is a saying in Spanish about springtime weather which goes “when in March it Mays, in May it Marches.” Maybe I am just one of those souls who are subject to the power suggestion, but I am inclined to believe that, over the years, the meteorological theorem for the most parts holds true. And presumably the opposite is true under normal circumstances. Well, I can promise you that we can expect some great weather in May because it has been about as marchy a March as you can get. Rain, rain and more rain, with a few gusty days to boot. Part of this has to do with the fact that it is Semana Santa and it always rains at Semana Santa. The clouds wait for the first pasos to emerge from the church threshold and, boom, your average healthy downpour. This year the precipitation has been particularly abundant. In a sense this is great because Spain is a land which is almost never quite satisfied in terms of rainfall. And once the dry summers drift in, there is no hope until fall again. That’s why winter rain and snowfall are vital, and this year has been particularly positive in this sense. 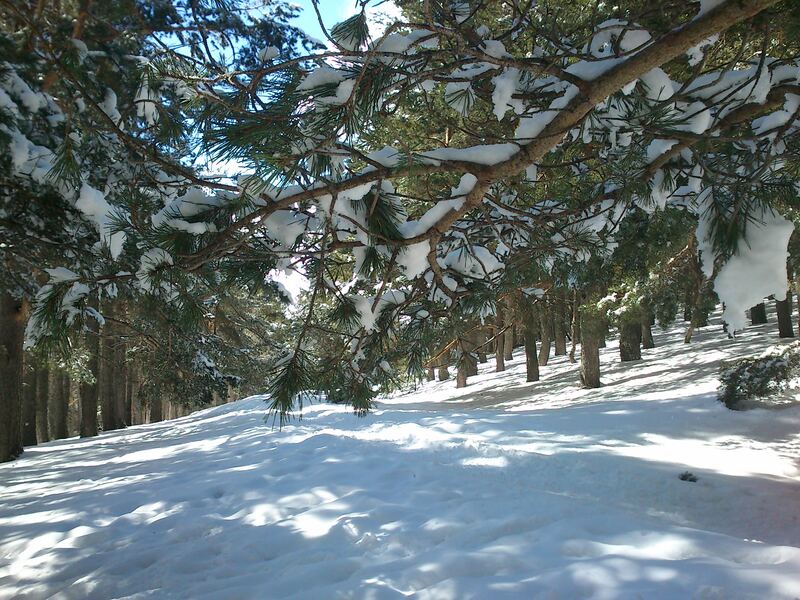 The Sierra de Madrid has been smothered with a thick layer of snow. Some may be surprised to read that there are mountains so close to the capital, aren’t we supposed to be in the open plains? Despite Henry Higgins’ little rhymes to get a person to speak the way no sane human would want to, Spain, while home to large stretches of open plains, also happens to be the second most mountainous country in Europe, after Switzerland. I am dead serious. The Sistema Central, or Central Mountain Range, a chain that forms a bumpy southwest-to-northeast scar across the heart of the land, and dividesSpaininto basically two major climates. They aren’t the Alps but they’re no slouches either. Many peaks soar above the 7000ft mark, higher than anything you would find east of the Mississippi and the tallest in Madrid, Peñalara, stands at just a hair below 8,000ft, making it in my opinion, officially rugged in nature and not to be taken lightly by inexperienced climbers, especially during the winter. In fact, two people had to be rescued just the other day when they got disoriented and had to spend the night near the summit in a makeshift igloo. And if I recall correctly, several unwary and unfortunate hikers have lost their lives up there. Here is some physical proof. 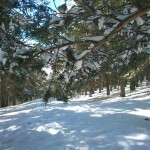 This is a shot of the pine forest near the top of the Navafría pass. It’s still about a 1,000ft below the highest point up there called El Nevero. I topped it last summer in August, and I can promise you that even then it was somewhat chilly during the day. There was a chance I was going to head up there in March. Snow-whitened escarpments are a habitual part of the landscape at this time of year, and it isn’t unusual for patches of the frozen precipitation to be seen well into June. So, as I was saying, the precipitation has been outrageously plentiful and the reservoirs are full to the hilt. Capacity, which, you might be interested to know, is about 87%. It sounds a little odd, I agree, kind of like perfect unemployment rate being somewhere in the neighborhood of 4%, but it is necessary to avoid a sudden rush of water and having it all spill over in an uncontrolled manner. That way, the region has some leeway. Still, it isn’t often we can enjoy this much hydro-comfort and there are some who criticize the authorities for not having set aside more room to increase the supply, because, as anyone who has lived here long knows, dry spells can go one for a long time in this country. For those of you who are boring like me and get a kick out of following these things, you can go to the Canal Isabel II website and get a daily update and the levels, reservoir by reservoir. So, if Spanish sayings are anything to go by, we can expect a great May to enjoy the best springtime in this city can offer the visitor and resident alike. Spaniards who have been toAmericaand, now here’s the real factor, have actually sat their buns down on one for any extended period of time, can personally vouch for this. They know what I mean. Every time I take a group over to the States, the minute they see the bus waiting to pick them up at the airport, the gawk, “What the hell is that?” But they do want to get on because deep down I know they are aching to find something which is technologically inferior to what they have and they are absolutely right. And that’s because Europe is entirely different. They take their bus travel seriously. The autocares are capacious, comfortable, smooth and sleek. And they take you to a lot of places a train or plane can’t. There is just one thing, I can’t stand them. I really can’t. Oh, I know if I have to travel that way, I will get to where I want with relative ease and style, and that there exist worse modes, but they just aren’t my thing. No matter how much has been done to ensure comfort, they just plain seem poorly designed to me, and they are only really useful if you are interested in discovering where all the muscles in your body are. After a few hours, each strand lets you know its location and how it is feeling at the moment, which generally ranges from dreadful to deathly. On top of that, bus trajectories tend to highlight local tourism and ensure success by stopping in every goddamn town the region has available. And, as luck would have it, someone always has to be picked up at one those places. The traveler straggles out of the bar where he has purchased his ticket and hoists his body onto the vehicle, where he scans the aisle for a free seat. Then the bus, hisses, the engines grumbles and grinds, and the whole ten tons begin to roll away. They run through the same procedure twenty-five times on a trip, so at night, the notion of getting rest is something the non-passengers in the country will get plenty of on your behalf. The awful movie selection tends to do the rest. I can stand maybe two or three hours of them, but then I just want to start being nasty to people beyond that point; and I can assure you that I act indiscriminately. Back in the 1980s, I had little say in the matter. Buses were cheap and so was I. But it soon became apparent to me that, being an American and thus born with wheels, I would need to get my hands on a car.